In light of what happened in Gush Katif over the past few days, it might seem tempting to yield to despair. Our enemies are rejoicing, our brethren are homeless, and our Land has been divided against our will. These are difficult times for Israel and the Jewish people, but we can not and must not succumb to despondency. G-d is on our side, our cause is just, and eventually we will prevail. We must hold our heads up high and march forward, nourishing the dream and working towards the day when Gush Katif will once again return to our people. On this theme, I wrote an article that ran in the Jerusalem Post a couple of days ago, and it appears below. The bottom line is very simple: if we stand strong in our faith and firm in our belief, Jewish Gaza will again be rebuilt. The siege of Gaza Jewry has begun. It is hard to believe that we have reached such a point in the nation's history. After so many years of struggle and sacrifice, those once celebrated as pioneers by successive Israeli governments are now jeered at as they face expulsion from their homes. Yesterday's heroes have been transformed into villains, with Gaza's Jews demonized as obstacles to peace and treated with contempt by much of the media. Withdrawal under fire, once derided as capitulation to terror, has now become government policy, as the Palestinians celebrate their success in chasing out the Jews and speak of Jerusalem as now being within their reach. And, in an unprecedented move, the Israel Defense Forces have been deployed against the citizens of their own state, with the express purpose not of defending the Jewish people but of exiling them from parts of their ancestral patrimony. Is this the end of Zionism? 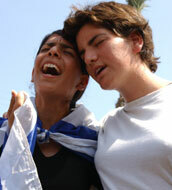 Could it be that the 2,000-year old dream of the Jewish people to return to all parts of our land has been vanquished? Some Israelis certainly seem to think so. In an article this past Monday entitled "The dream is over," Haaretz commentator Yoel Marcus wrote with barely concealed joy about a "farewell to the idea of Greater Israel," going so far as to label those who still cling to such a vision as "Land of Israel lunatics." Veteran journalist Nahum Barnea, in a July 1 column in Yediot Aharonot, went a step further, asserting that " Israel can live without Gush Katif. It can even live without Jerusalem." But I, for one, refuse to call it quits. Despite the heartbreaking scenes from Gush Katif over the past few days, and the folly of the government's withdrawal, this is no time to yield to despair or give up hope. To be sure, Zionism suffered a terrible blow this week as the Jewish state unilaterally retreated in the face of terror. While many on the Left may be cheering this move, anyone with even an ounce of human, Zionist and Jewish dignity still remaining surely recognizes just how painful and traumatic this turn of events is for the Jewish people. But this is hardly the first setback we have suffered in our long and sometimes torturous return to Zion, and it is almost certainly not the last. Indeed, every ideological movement inevitably encounters stumbling blocks and impediments on the road to reaching its goals, and Zionism in this regard is no exception. The real test of a movement's strength lies not in whether it can avoid such difficulties, but in its ability to get up after a fall and continue marching forward. TAKE GAZA, for example, from which Jews have been expelled seven times in the past two millennia. The Roman governor Gavinius threw out Gaza's Jews in the year 61 CE. Subsequently, they were exiled by the Crusaders, Napoleon, the Ottoman Turks, Arab rioters in 1929, the Egyptian army in 1948 and now by Prime Minister Ariel Sharon. Each time, however, the Jews eventually returned, guided by their determination and their faith that this land truly does belong to us. They rebuilt Jewish Gaza, the land of our ancestors, and I have no doubt they will do so again one day, once the situation permits. Economists like to speak about what they call the "elasticity of demand," which is essentially a measure of how consumers respond to changes, such as price. I would argue that Zionism and the belief in Greater Israel is essentially inelastic, meaning that even in the face of setbacks and defeats the Jewish people will continue to cling to the justness of our cause. People on the Left such as Marcus and Barnea might very well differ, but their perspective is ultimately narrow and shortsighted, and it ignores the long sweep of Jewish history. For even in the darkest and most foreboding periods of the Exile, Jews never doubted that they would one day return. Massacres and pogroms, Inquisitions and expulsions never broke our collective spirit, and neither should the events of this week. The fact is that Sharon and the Left may be able to withdraw from Jewish history, but they cannot withdraw from Jewish destiny. They can bend and twist and stretch classical Zionist and Jewish beliefs, but they cannot break them. For even in the face of uncertainty the dream of return lives on. It might take years or even decades to achieve, but of one thing we can all be sure: The Jewish people will eventually bounce back from this fiasco, just as we have throughout the millennia. And soon enough, the sand dunes of Gaza and the hills of northern Samaria will once again most assuredly be ours.